Last December, my cholesterol was about 185 mg/dL. I thought that was pretty good, until I learned what cholesterol meant. Good (HDL). The main goal of HDL is to keep the LDL at bay. Increasing your HDL can be easily done by increasing aerobic activity and eating a healthier diet. Smoking cigarettes can decrease your HDL. Bad (LDL). The artery- clogging, heart attack causing, stroke encouraging bad guy. Don’t get me wrong, you need a decent level of LDL since it’s naturally produced from the body. Just not too much. Saturated fats, trans fats, dietary cholesterol, genetics, and bad diets are all to blame. If high cholesterol runs in your family, some serious lifestyle choices can help lower and manage your levels. Triglycerides. A form of fat made from the body. Elevated amounts are found in overweight/obese, physically inactive, excessive cigaret smoking, excessive alcohol consuming individuals. High carb diets also fit into this list. High triglyceride levels are positively correlated with high cholesterol. If you have diabetes or heart conditions, you are also more likely to have higher levels as well. Lp(a) Cholesterol. This guys is a genetic variation of LDL, but is specific to the premature development of fatty deposits in arteries (that can lead to narrowing and blockage). The Mayo Clinic provided a guideline for healthy levels of cholesterol (in milligrams per deciliter), but each person is unique so results may vary. I am happy to report I went down 30 points by that summer by making some simple life changes! Even my triglyceride count reduced. In other news… I used my crock pot for the first time! 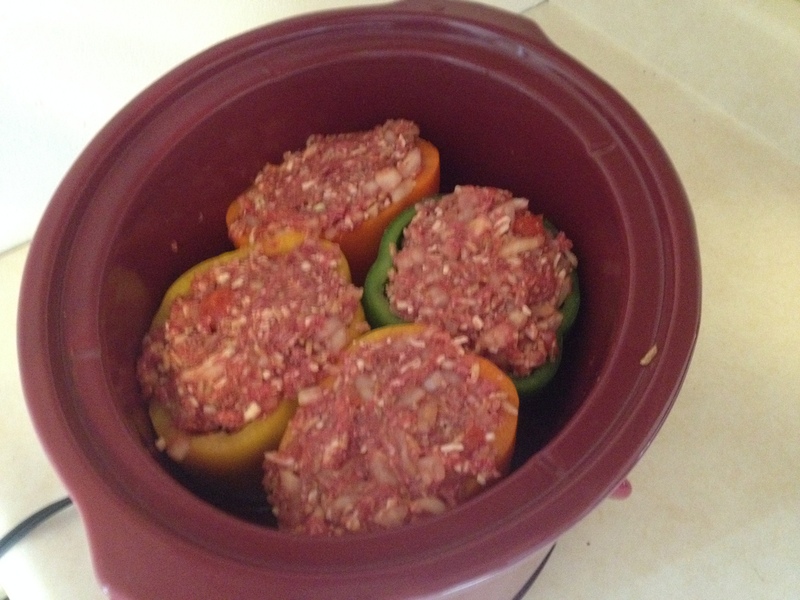 Bison stuffed peppers with rice and cheese! yummy! Saturday I went to yoga for runners and today I ran 2 miles. Hope everyone works up a good sweat! Who needs meditation when you have aggression fueled workouts?! Since it’s so cold (-11 degrees), a friend of mine and I decided to try out some Bikram! There is a studio downtown and we found coupons for a $10 class if you bring your student ID. Before just jumping in, I decided to do some research! I found out that Bikram yoga is a specific type of hot yoga. The room is heated to about 100 degrees with around 30-40% humidity. Basically yoga in a sauna. Unlike other yogas, Bikram uses the same sequences each session in order for yogis to practice and complete full expressions (expert level) of poses. This is not a slow yoga, you’re heart is racing the entire time! I burned around 600 calories! (If you have a heart rate monitor, it will be more accurate). Don’t panic. The heat can be overwhelming but try to keep breathing through. It’s okay to sit down and reconnect with your breath if you start feeling waves of anxiety. DRINK DRINK DRINK. It’s good to drink around 8 cups before practice, but through out the day and not right before. Make sure that you also store up on electrolytes. I use Shaklee Performance before and sometimes during my exercise to help retain some water from being sweated out. Show me some skin! You are going to sweat like a pig. The less clothes the better. I’m talkin men in little booty shorts and girls in just sports bras. Try to wear something that’s not cotton so the sweat doesn’t sit on your skin. It’s a no judgement zone. Eat Well. Yoga, like any work out, requires you to feed yourself right. This also includes not eating about an hour before class- just like with water! You don’t want all that food and water sloshing around in your tummy! Go at your own pace. This is your time to stretch and meditate. If you can’t touch your toes- you’ll get there! If you need a moment to readjust, it’s okay. Try it twice. The first time you try it you might not like it or get freaked out. Try it a second time if you can, now you know what to expect and how to prepare! I really liked it! I hate running in the heat and I’m hoping that maybe practicing Bikram yoga will help with that. The instructor was like a drill Sargent! I’ve been really tight from stress and running so I’m hoping that this will help too! Next time I’ll make sure to bring my own sweat towel and hydrate a little more. Other than that, I think I did a decent job preparing myself physically and mentally. Today I’m off to mount Stowe to hit the slopes! I haven’t been boarding since New Years day. So what is a cold, injured runner supposed to do?! I have 80 days until my half marathon! A 2004 study reviewed the apparent differences in heart rate on the treadmill compared to the elliptical machine. While the researchers did not find the same elevated heart rate levels seen in the previously mentioned study, they did find that the rating of perceived exertion (RPE) was the same in the chest and actually more intense for the legs on the elliptical compared to the treadmill (presumably from the incline). As such, the researchers concluded that using RPE as a measurement of effort can produce fitness results similar to running. And another study compared metabolic and cardio-respiratory improvements following a 12-week training program using an elliptical trainer versus a treadmill. The researchers found that when training volumes and intensities were equivalent on the treadmill and elliptical, physiological adaptations remained relatively the same. The studies were performed on a small group and therefore the results are limited, but they indicate that while the elliptical is not a perfect substitution for running, it will allow you to maintain some level of fitness during time off from training. The only potential drawback to the elliptical machine for injured runners is that it can still aggravate some injuries, despite the lack of impact. Those injuries include stress fractures, achilles injuries, and IT band issues. So, be careful and listen to your body when on the elliptical. Meaning, if its too cold, elliptical training is a good second choice if you’re like me and hate the treadmill. If you want to seriously run, you shouldn’t consider the elliptical as a major training component, but mimicking your usual run route and duration should be a good replacement. Today I used a hill option and was on for 30 minutes. Since the strides and speeds are different, you should pay less attention to actual mileage and more on heart rate and time. 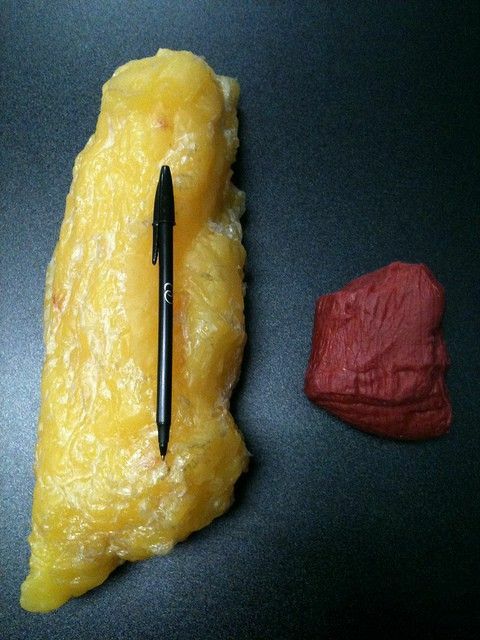 5 lbs of fat next to 5 lbs of muscle. Don’t let the scale fool you! I wanted to share this really cool new app/ website called RunKeeper! It has other exercise options too (like cycling), but since I’m a runner I’ll tell you all about the running aspects. First off, It lets you set goals for yourself! I don’t mean just weight loss. I have my half marathon countdown going on. I then I went running! I had so much fun! I was listening to my music just going along when all of a sudden the music faded and a woman’s voice told me I had been running for 5 minutes and I had traveled .5 miles and my average pace was 10:00 minute miles. Every 5 minutes her voice would come on giving me updates! So much fun! Now if you are running or cycling you can even get training schedules to help reach a goal! My only complaint is that I can’t make my own schedule to follow and that I can’t figure out how to rearrange the days on the training schedules they made. 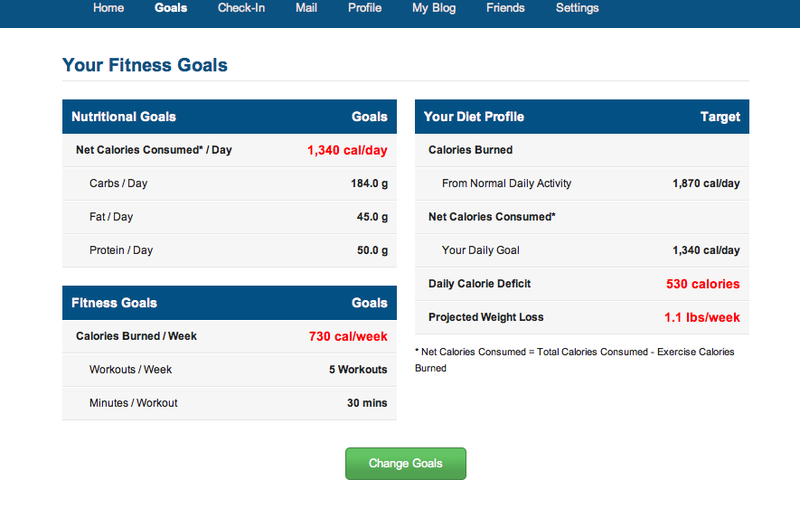 I think it would be really cool if this app and MyFitnessPal would merge into a super exercise app!! Hopefully this motivates me to keep running and helps me keep track of maintaining a pace! Calories calories calories… those nasty little buggers are everywhere! You need them to live but excessive amounts can be deadly- at least to your figure. Many people try calorie counting websites and apps to help keep themselves in check, but don’t see it for what it really is and what it can really do. I have a problem with this. I watch people abuse the system a lot and wish that someone had explained to them how useful of a tool it actually is. Through out this explanation I’ll be using the calorie counting website I use (because I love it), but if you have you prefer another way that’s fine too. 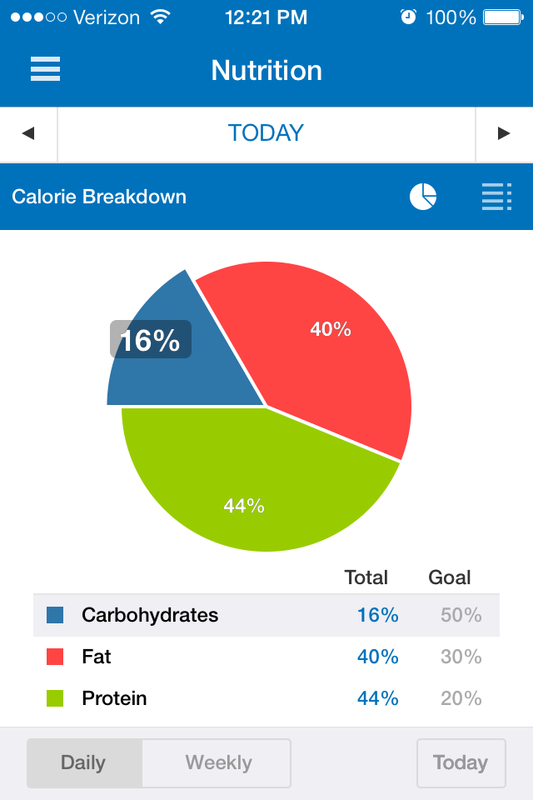 Before I get into the bulk of this post, I just want to say that calorie counting isn’t for everyone. I have a slow metabolism and eat when I’m bored or stressed. If your an anxious person, maybe consulting a different type of diet will help ease your mind while still watching what you eat. My Plate is the new and improved food pyramid. 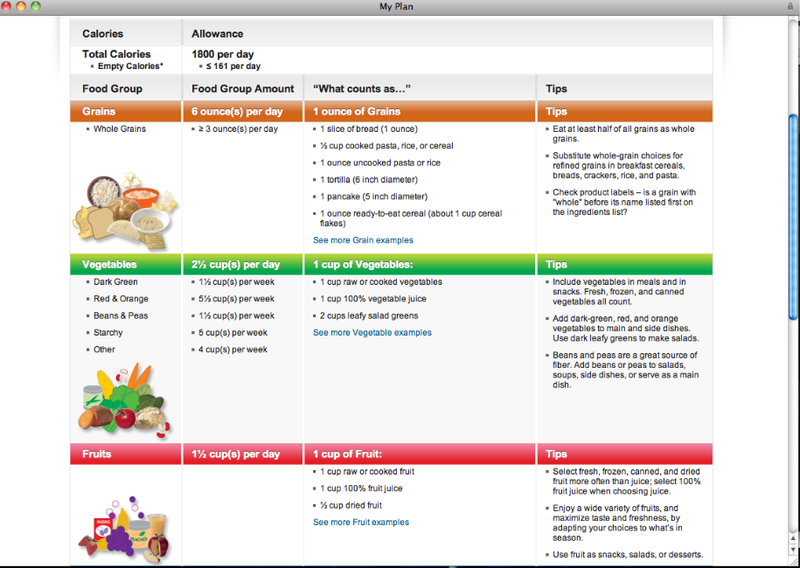 It also has a calorie counter but it also offers a guide to ideal portions of each food group depending on the individual. Here’s what it said for me! You don’t even need a website, just following serving sizes and being aware of what’s going into your mouth helps so much! 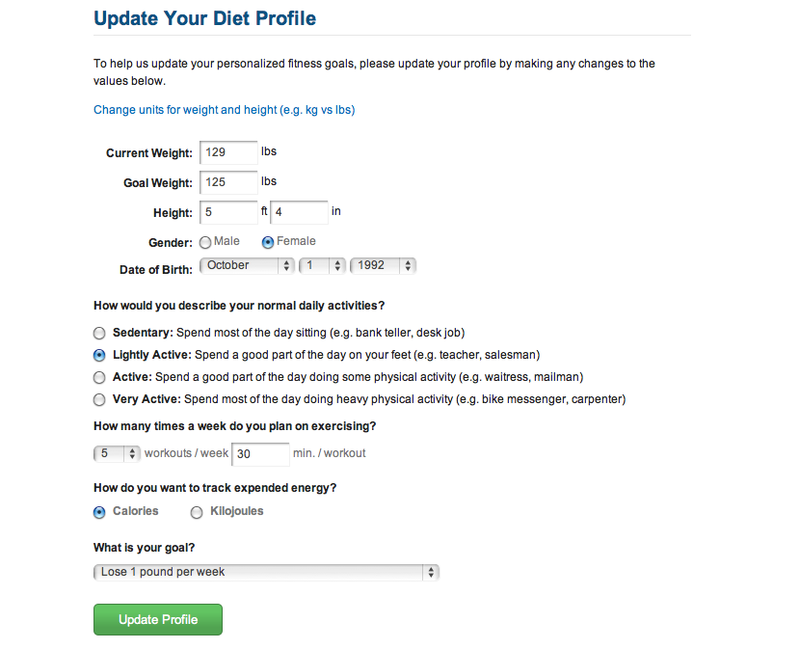 Any who, MyFitnessPal helps create a daily net intake of calories based off of your high, weight, exercise level and desired weight loss and rate of loss. Here’s my profile. Currently I weigh 129 and I want to lose 4 pounds. I have it set to losing a pound a week, but I know that this isn’t always legit. Being a woman is frustrating because we fluctuate from hormones and stress. Just try to hover around your goal weight and don’t be fixated if you gain weight a pound or even two! You can set it up to 2 pounds a week but that hardly seems healthy or possible. It’s all about the realistic goals and mini goals. I set mine to lightly active because I’m a college student on a very large campus. Then it gives you a summary of your goal and what that requires exercising and eating right and how many time a week you want to work out. 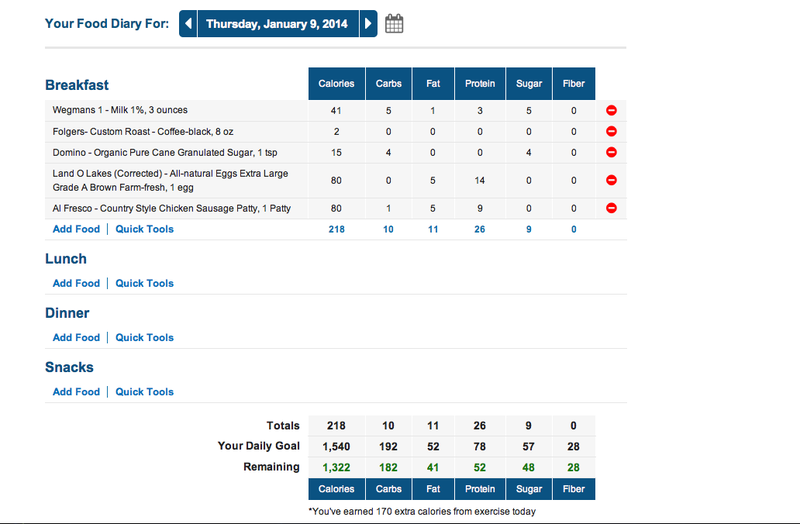 Now that I have my goals set- it’s time for the food logging. Sometimes it seems a bit tedious. Now thats I have an iPhone this has become simpler. If you don’t like to use your phone, the online website is really easy too. It might be a good idea to get used to the website before using the app. If you have a smartphone, you can actually scan the barcode and it will usually recognize and register food. Yay for technology! Counting calories is much more than adding and subtracting all day and worrying about it. It’s very easy to scrutinize each meal. I found a healthy balance between using my brain to help me decide what I want to eat over my stomach and most importantly portion control. I do measure food out, it’s amazing how much or little one serving is! 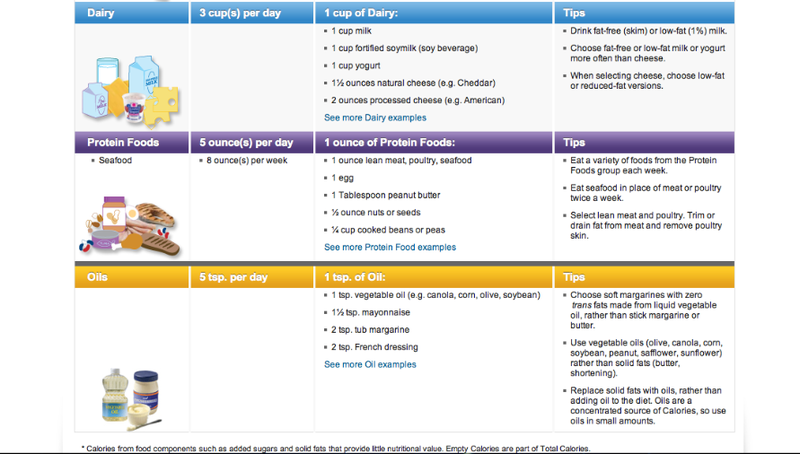 Portion control and timing is a whole new post in itself (coming soon)! Just remember that if you go over one day do not get upset or punish yourself the next day. 80% diet-20% indulgence. Work hard and stick to it 80% of the time so you can really enjoy a treat (its not treating or caving, its being human). No denying. If you can’t beat the craving, compromise! Tomorrow is a new day and a new beginning. Hopefully this is helpful to you guys! Let me know if you have questions! So, we have some catching up to do! Since my first half marathon, my workout regimen has been none existent. I had surgery in August and have been on the mend for a long time. It’s also pretty cold in Vermont and school has been time consuming. [Insert more excuses here]. 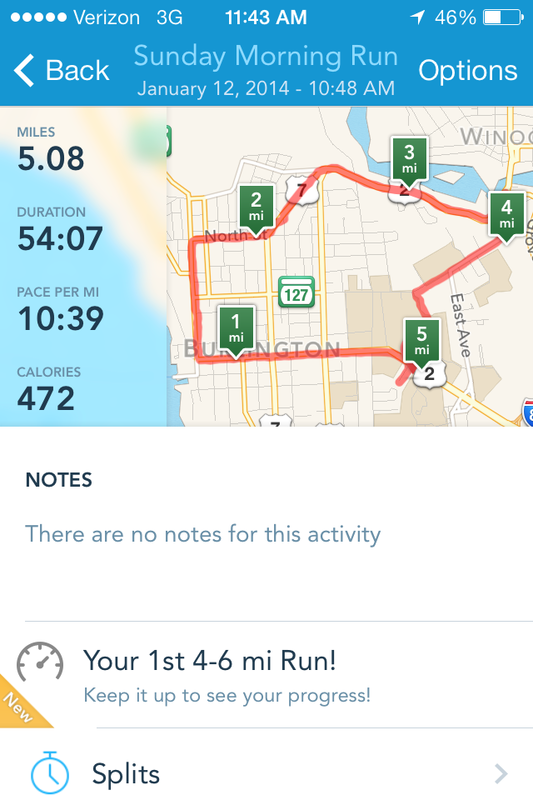 Any who… I’ve slowly started going to the gym and participated in my first Turkey Trot! It was really cold, but so much fun! 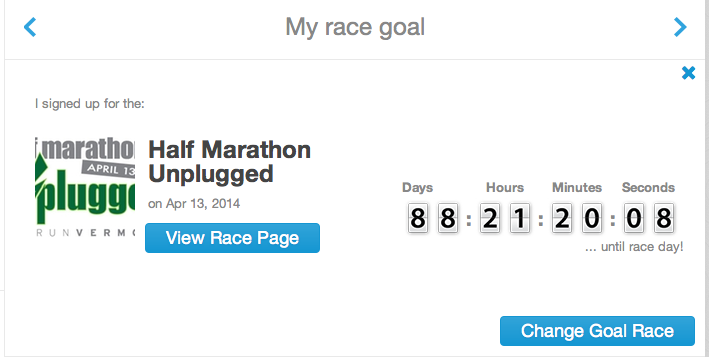 Now I have my eyes set on another half marathon April 13th (93 days!). The winter storm is kind of messing me up, but I think I’m still on track with the running schedule I created. Idealistically I’d like to set a new half marathon personal record, but realistically I’d like to run the entire thing without developing 12 blisters by mile 9 (I wish I was exaggerating). After that? Who knows! 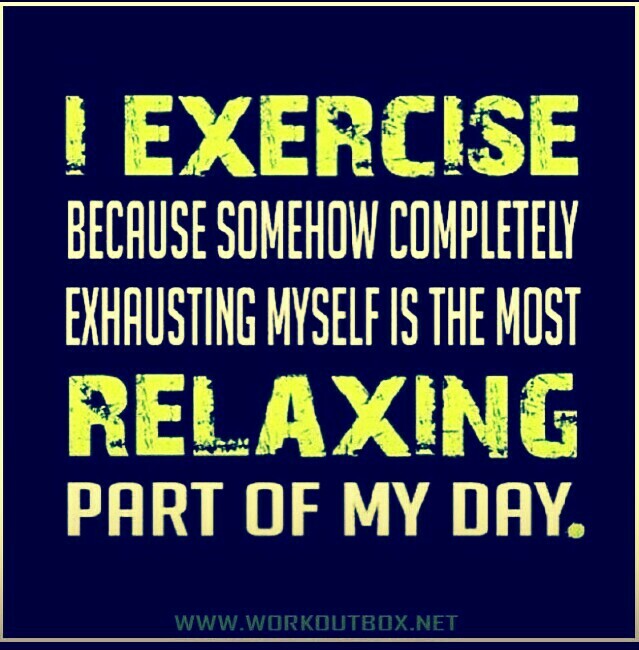 Currently, I’m primarily working on running and a bit of cross training as well. I’m also looking to revamp my workout playlist “Run For Your Life”. I like good pace setting beats- any suggestions?